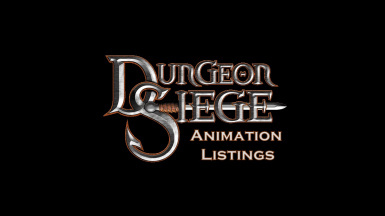 Created out of need for my own maps and mods for Dungeon Siege 1, the Dungeon Siege Animation Listings will give you a full visual list of all the non-standard animations tied to males, females and dwarves in Dungeon Siege 1. Each character that is currently playing the animation has had their in-game name changed to the name of the animation. Some animations may appear similiar to each other. However, they do have subtle differences. The map should be compatible with literally everything in the vanilla game. DSLOA is not required. Dungeon Siege ties all it's animations into four letter titles. Hence, DRNK means to drink a potion and GTUP means to get up. This can make some of the more advanced animations harder to understand the purpose of. Editors are free to use the data stored on this map as they see fit. Extract the .rar on the downloads page and put AnimationMap.dsmap in your Dungeon Siege > Maps folder. Dungeon Siege, DSLOA and DSMOD should be able to recognize it as a map. Protip: When using DSMOD, create a shortcut to DSMOD and put the following at the end of the line in target: map=animation_map. When loading DSMOD.exe through the shortcut, Dungeon Siege will bypass the main menu and immediately load the map. Saves you a time and a few clicks. GTUP: Stand up after being unconscious or dead. LOOK: Look straight ahead with minimal movement. ULOR: Talking animation for when you first encounter Ulora in DS1. HDUP: Stand up from the HDDL position. ULO1: Variation of DRNK. Never used ingame. SIT1: Sit on a chair with hands on knees. HOE1: Use a hoe/tool to tend a field. (Used in the opening cutscene). This animation does not loop properly. GTUP: Stand up after being unconscious/dead. LOOK: Look straight ahead. Slightly different to the female version. WYME: Character looks upwards with arms outstretched as if to say "Why me?!" FRTD: Look around as if the character is afraid/being watched. BED1: Sleeping on a bed. BED2: Variant of BED1. Rusk's starting animation before you encounter him. BED3: Fall out of bed and stand up, rubbing head. Rusk's opening animation when you encounter him. MRIK: Merik's talking animation when first talked to. SIT1: Sit at on a chair with arms on table. ANDI: Andiemus's talking animation when first talked to. FROZ: Frozen. Merik's animation when frozen in ice. LBLG: Regular standing animation with variant poses. GYRN: Gyorn's animation when first talked to. GLRN: Gloern's talking animation when first encountered. LOOK: Variation of normal standing animation. I hope someone finds this useful! Enjoy!